Directions: Wash face with facial cleanser once every day. Lather the foam thoroughly over wet skin, rinse well and pat dry. Avoid eye area. Clarifying Skin Toner is one of the best products for adult acne. It eliminates the pore-clogging impurities, decreases the size of pores, and reduces redness and sensitivity. This acne control products treatment contains botanical extracts, to enhance the skin’s renewal, leaving it vibrant and smooth and is one of the top hormonal acne products. Directions: Use once daily. Apply to entire face with a cotton swab and allow to dry. Avoid eye area. Clearogen Acne Lotion is the most important part of the acne treatment products system. It contains the natural ingredients proven to reduce DHT production and help restore normal oil production to the skin. It also contains Benzoyl Peroxide, to open the pores and kill the acne-causing bacteria. 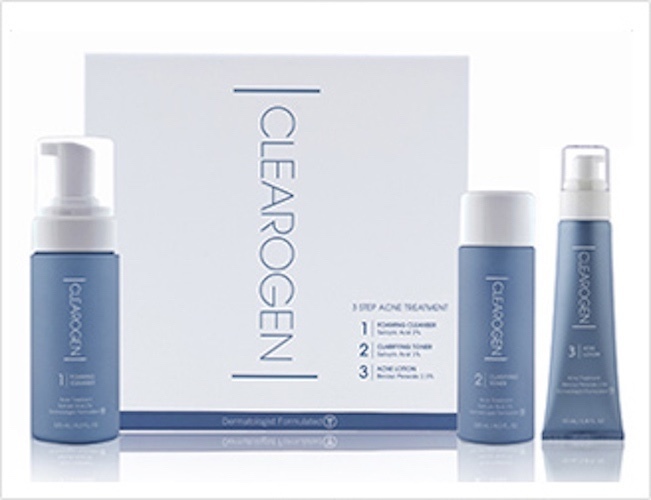 This combination of products makes Clearogen Acne Lotion one of the best acne clearing products on the market today. Directions: Use once daily. After using Clearogen Facial Cleanser and Toner, apply the lotion evenly over the entire face. This adult or teenage acne product is the final step in clearing up your troublesome acne and should be your first choice for acne products today.